A month ago we let you know that Solo Mobile “will no longer be activating new customers.” Today is the day that Solo officially goes dark on new subs. Their website states that “we’ve loved giving wireless service to Canadians since 2005 — and we’re super excited to support our existing clients for years to come. However, we’ve decided not to take on any new customers.” This is a move to bring new customers over to Bell’s prepaid service – who just revamped their prepaid plans today – and potentially increase ARPU. If you’re a current Solo customer you’ll still have active service for “years to come,” and have some new device choices too: Samsung Galaxy W ($59.95 on a 2-year and $249.95); Samsung Galaxy 551 ($9.95 on a 2-year and $199.95 outright); and the Samsung C414 ($19.95 on a 2-year and $119.95 outright). It was a good 7-year run. 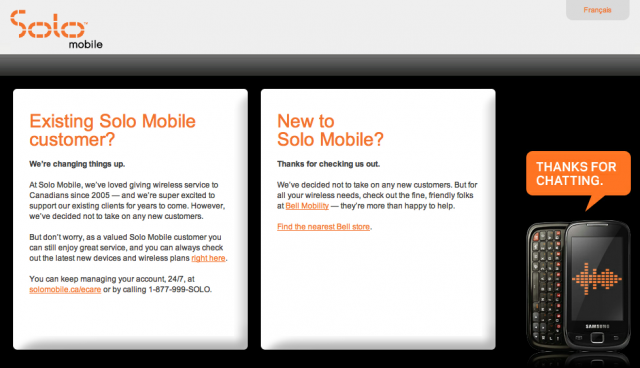 Check out Solo here, or the new Bell Prepaid plans here.